My route of the day was Praya-Senggigi-Bangsal-Gili Air. An airport bus or DAMRI took me from airport to Senggigi, it's approximately one hour, cost IDR 25.000, very convenience and affordable, I can say. After I arrived in Senggigi, then I ride a taxi to Bangsal. You will see beautiful view of Lombok inside taxi. I kept starring mountains and sea on my left side. It was beautiful. Lombok offers the beauty of the nature. I stepped out from taxi and went to ticket office in Bangsal. 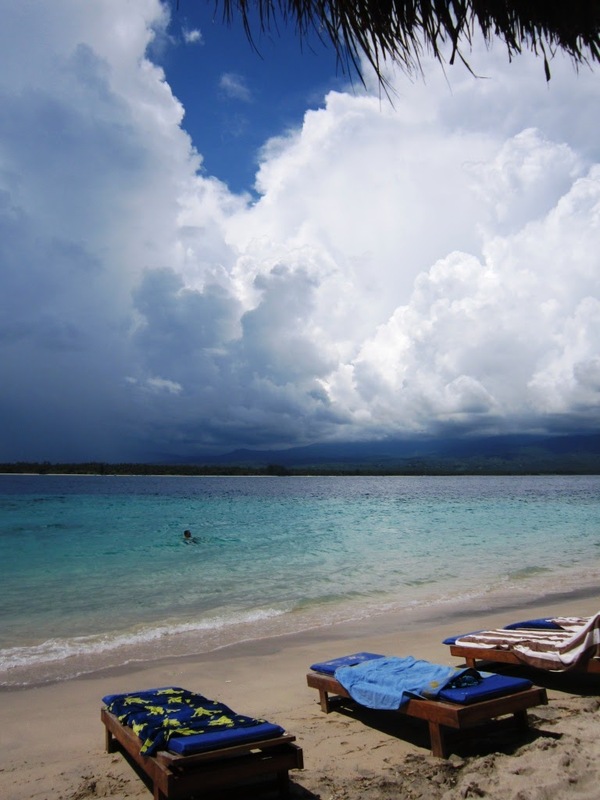 There are two options to reach Gili Air. First, we can use chartered boat. It cost IDR 155.000. Second, is public boat to Gili Trawangan, it cost IDR 10.000 then island hopping boat to Gili Air, it cost IDR 23.000. I chose second one. Gili Air is one of famous Gili in Lombok. The sister islands are Gili Trawangan and Gili Meno. 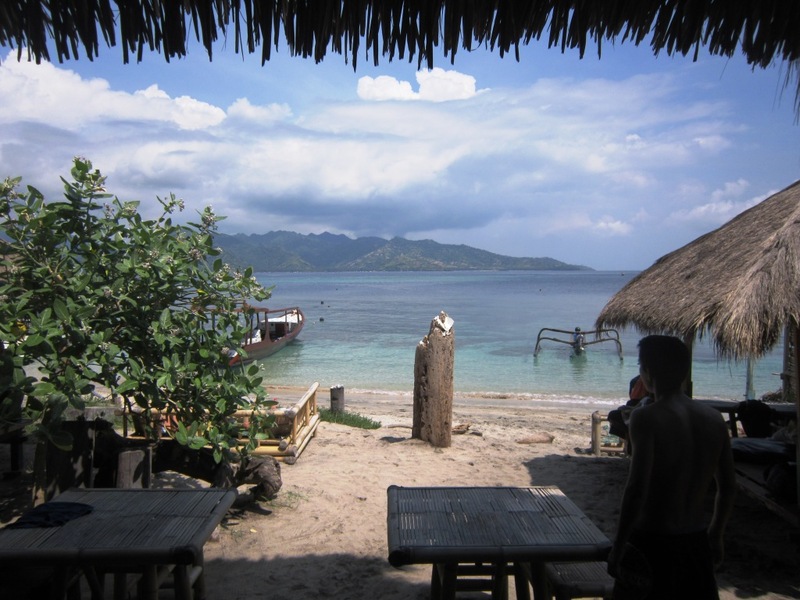 Gili Air has white sand beach, beautiful coral reefs, fishes and sea turtles. People say one of the best place for honeymoon. 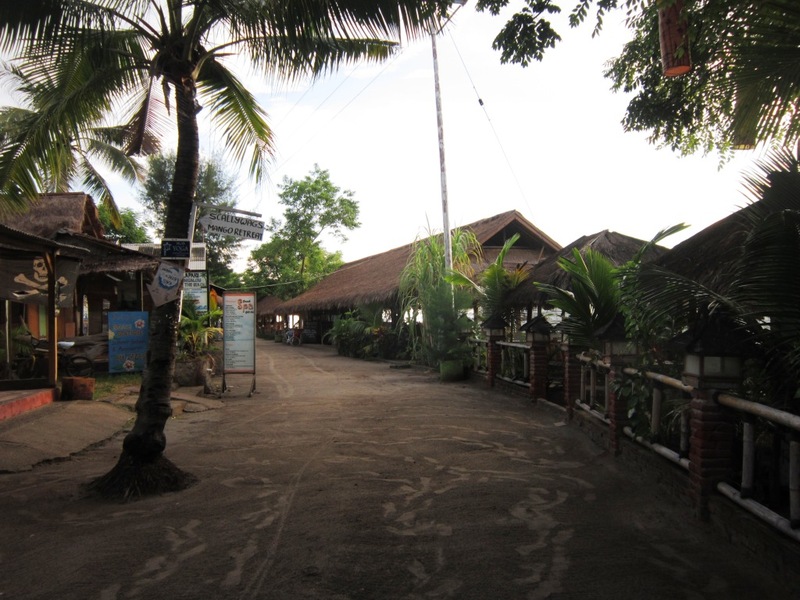 You can stay at hostel or hotel in Gili Air. It would be great if you book your hotel one month before on holiday season. I don’t have any agenda by going here. I want swimming, snorkeling, sun bathing, and café-ing as free as I want. No need an agenda for living in a paradise, right? After arrived in Gili Air, I went directly to Omah Gili, a place where I stay for three days in Gili Air. I stayed at Lumbung no. 2. When I saw my room for the first time, I kept smiling. A mixed traditional and modern style together. Inside my big room, I found cozy king size bed, an ac, a fan, towels, water, and the surprise was open bathroom. It's an outdoor bathroom, so we can stare at the sky while showering. Superb! Feels like home. Time to hit the beach, only 2 minutes by walking from Omah Gili, I saw a beautiful beach. I walked to Chill Out Bar because people are swimming and playing around there. 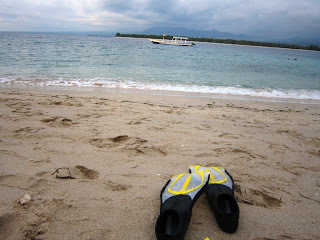 I was curious by underwater life so I wore my masker, snorkle, and fin then jumped into the beach. Not only colorful big fishes and coral reefs but also red, purple, yellow and green coral reef in front of Chill Out Bar. 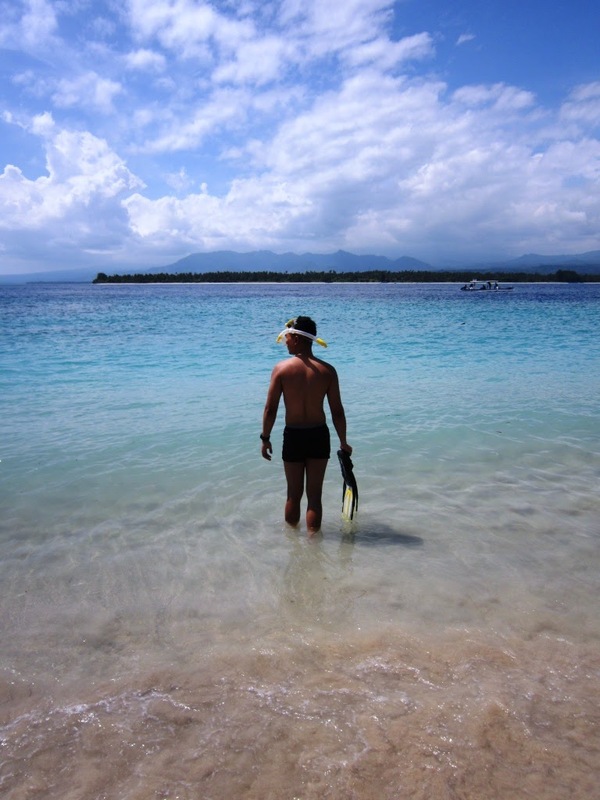 No picture but trust me, Gili Air has beautiful coral reefs. My holiday to Lombok was Green holiday. 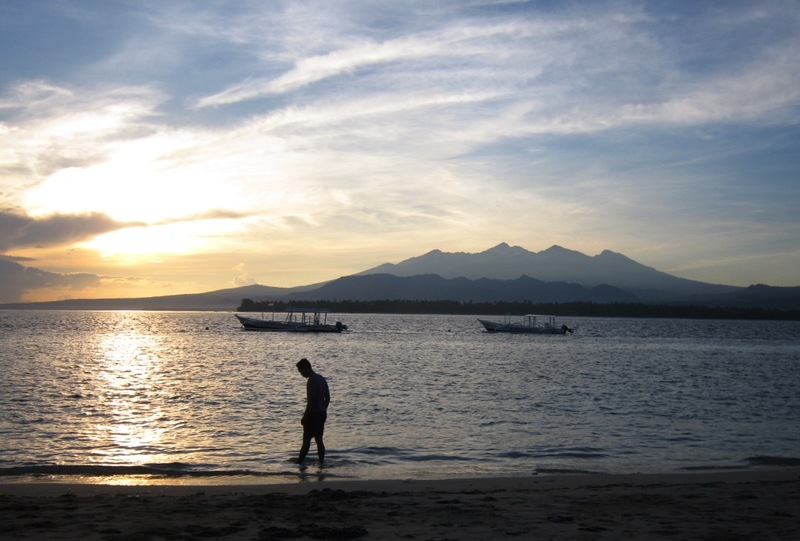 Gili Air has no vehicle, so there's no pollution around the island. We can breathe fresh air everywhere. If you wanna get around, our options are walking, bicycle, or cidomo. Riding a bicycle to explore the island is preferable. You can rent a bicycle for a day. 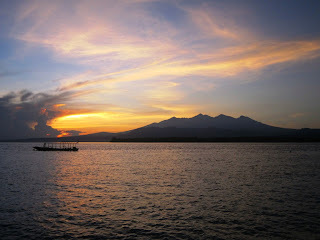 5 May, 2nd day of Gili Air trip, I woke up so early because i don’t want to miss sunrise moment. I walked by bare feet along the beach for sunrise walking. 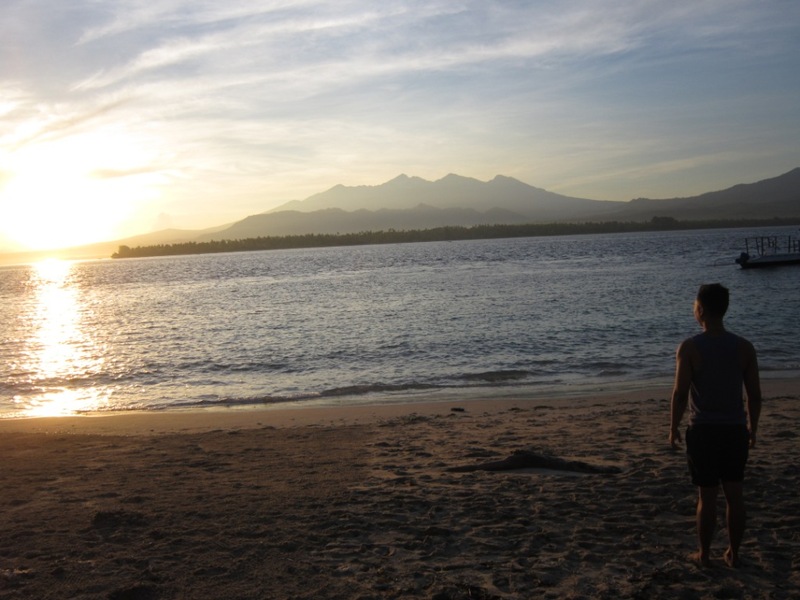 The sun shinning on the coast of Gili Air. It's beautiful landscape in front of my eyes. 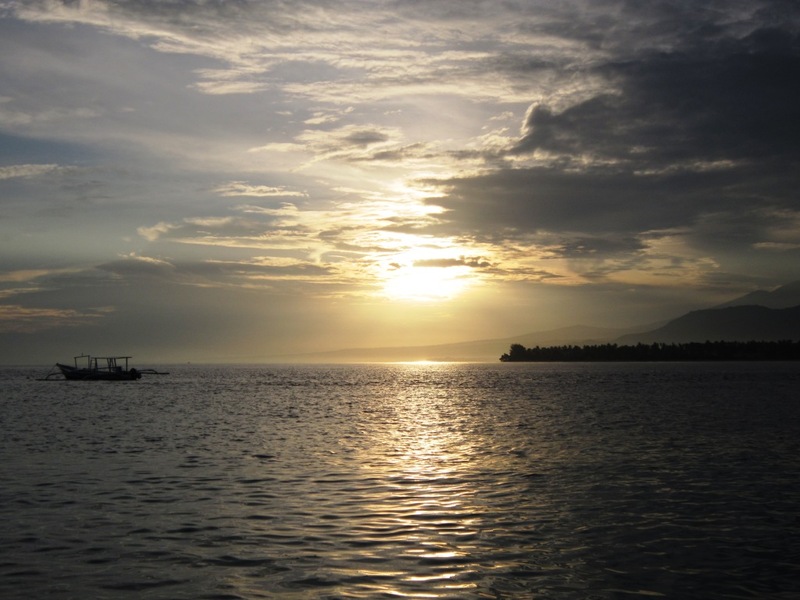 Can you see how beautiful sunrise in Gili Air? It was beautiful sunrise I've ever seen. Finished sunrise walking, back to Omah Gili for breakfast. I ordered banana pancake and orange juice. I made a good choice, i had the best breakfast on my second day. The taste was delicious. Orange juice was fresh and healthy. 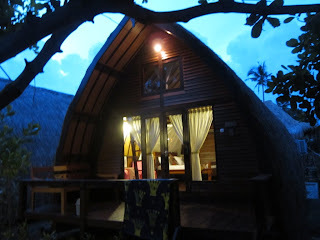 I recommended it if you stay in Omah Gili. Time to explore the island! 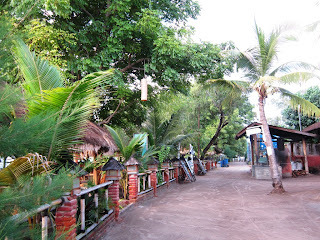 I explored Gili Air by walking. I walked to the north, many restaurants and cafes on my right side due to it's location close to beach, villa and hotels lined up on my left side. 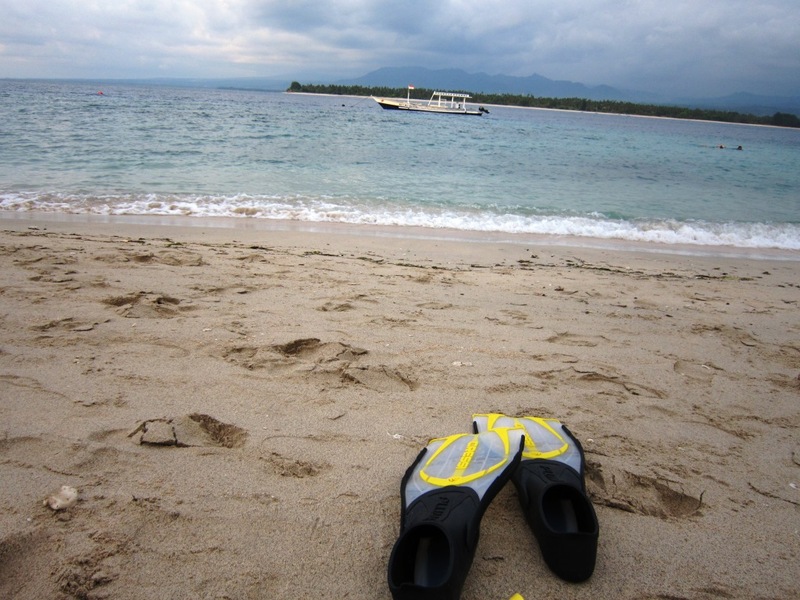 My first snorkeling spot was in front of Gili Air Santay, small fishes everywhere and coral reefs. Second snorkeling of the day was in front of Ali Baba. Dead coral reefs are everywhere. So sad. After that, I decided to go Chill Out Bar then ordered pineapple juice to accompany me. Sit back and relax enjoying your drink near bar. The third snorkeling of the day was in front of Chill Out, fishes in many size and colorful coral reefs like I saw a day before. Lunch time! 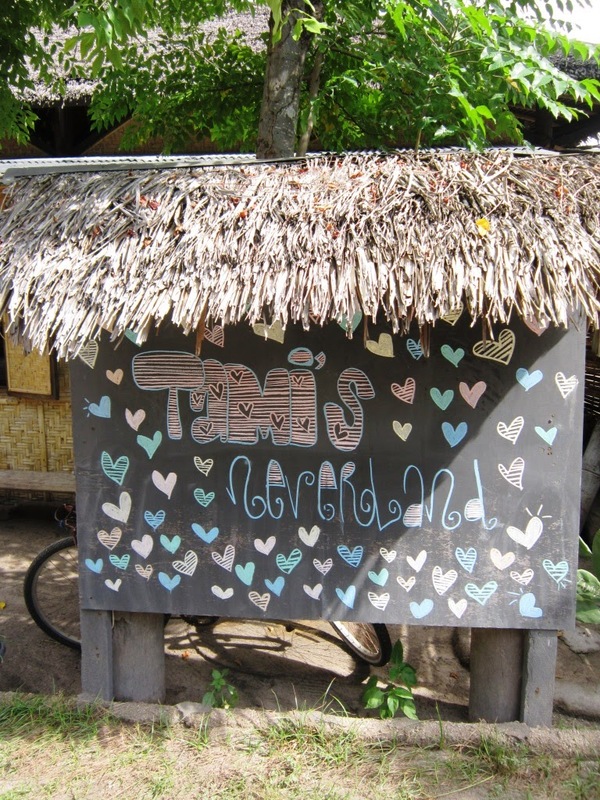 According Lonely Planet, Tami's Neverland was their pick. I decided to grab lunch at Tami's by walking. Snapper Steak and Pineapple Juice, I told the girl who stood next to me. Snapper steak was delicious. 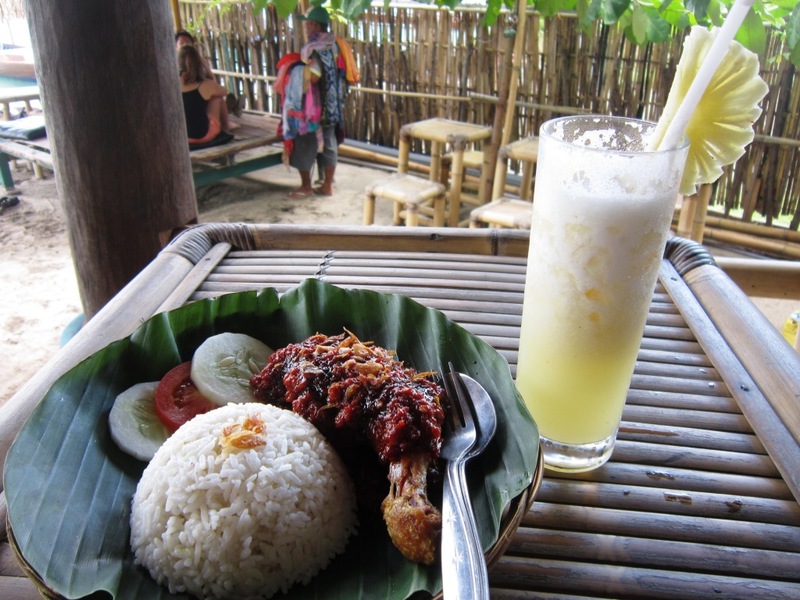 Overall, The best lunch of the day, beach front view, and great service. I only paid for IDR 44.000. My forth snorkeling of the day spot was in front of Tami's. OMG! Soft red coral reefs are everywhere. Red, green, purple, yellow, blue coral reefs are also everywhere. It's like a coral wall. Breathtaking view under water. It's awesome! Various kind of fishes are swimming around the coral reefs. Last snorkeling of the day was in front Sunrise Vila. It was awesome, that i can describe after I swam with a sea turtle for 15 minutes. I followed a sea turtle and he showed me red big coral reef. Snorkelingasm! Back to Omah Gili, take a shower under beautiful sky of Gili Air. It was amazing. The night was come out; time to embrace Gili Air has to offer by night out at Zipp Bar. 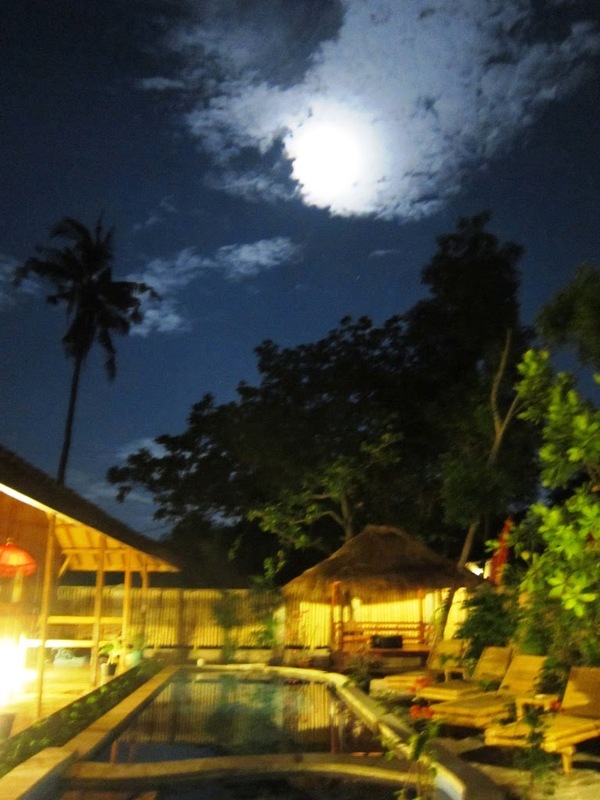 Let's drink and enjoy night view of Gili Air! A cocktail called Caprinha was my companion. 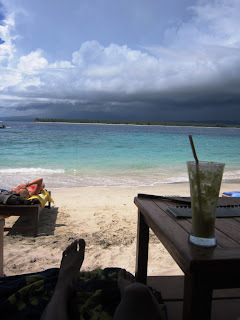 My second day at Gili Air was GREAT DAY. 6 May, 3rd day of Gili Air Trip. One of The happiest feeling in the world was watching the sun rise in the morning. 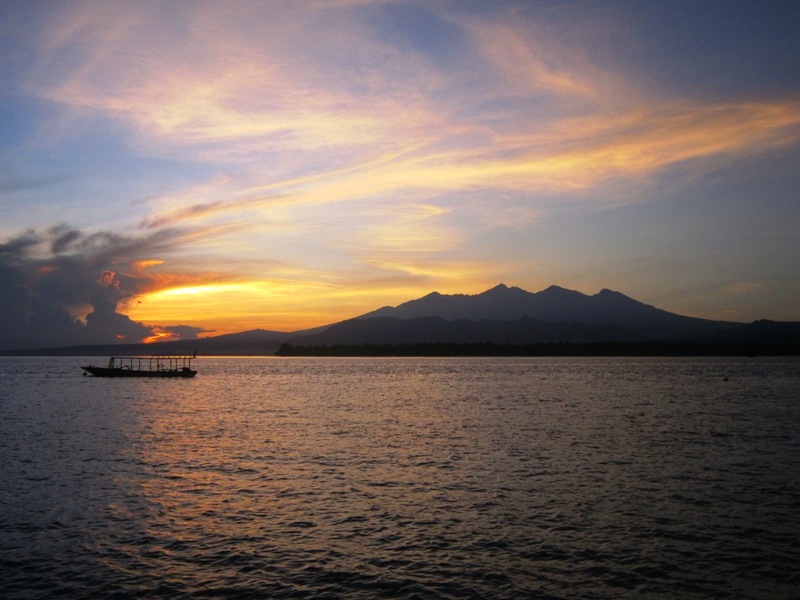 The sun came right next to Mount Rinjani in front me. It was beautiful. All I can say was thank you when I saw sunrise. I thank God, because i can be where i am right now. I feel so lucky. Sunrise walking was amazing. 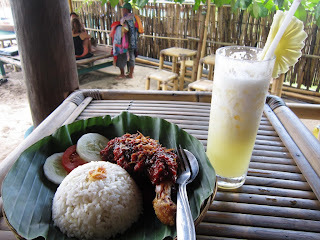 I went back to Omah Gili for Breakfast. Again, I ordered pancake but different fruit, pineapple pancake and orange juice. I like pineapple pancake. Very delish and yummy. I had the best breakfast in the morning. Happy! Mas Dita, the owner of Gii Air met me after breakfast. I had a good conversation about local tourism with him, such an eye opener. I’ve never talked with the owner of hotel when i travel until I met Mas Dita. I used to talk with local guide when I travel. Mas Dita also invited me a dinner in the best pizza restaurant in Gili Air. I left Omah Gili at 10 AM after we finished our conversation. I decided to go snorkeling in front Sunrise Vila. After looking for 10 minutes, finally I found sea turtle. Again, I kept follow sea turtle. I watched sea turtle feeding and playing around with small fishes. A sea turtle was coming to me. Two sea turtles were swimming in front of my eyes. I was speechless. Thank God, no one saw sea turtle like I did. Swimming with sea turtles for 20 minutes, I am so lucky. Sea turtles checked. I am off to Chill Out Bar. I put my beach towel on a chair, laid back and relax. Sunbathing while listening Young, Wild & Free by Snoop Dog ft Bruno Mars on iPod, nothing can beat this feeling. 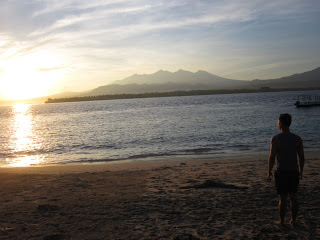 I enjoyed my time in Gili Air so much. After 20 minutes sun bathing, I sit on sand and let the small waves hit me. I start falling in love with Gili Air. Sunbathing and swimming checked. Again, I headed to Tami’s Neverland for lunch. I ordered Ayam Pelecing and Pineapple juice. Ayam pelecing is great, the sambal is delish. Enak tenan like Javanese people said. The sambal is quite spicy but I finished my drink before I finished my food. Thank God, then I remembered i brought my mineral water. I guess only few Indonesian who coming to Gili Air. I spent few hours at Chill Out Bar and Tami’s Neverland, the visitors mostly are foreigner. I am sad and happy in the same time. Happy, I can enjoy the beauty of Gili Air by myself. Sad, less local people who contribute to local tourism. What was missing in Derawan trip, I found the missing part on Gili Air. Sometimes a vacation is about finding a peace of mind with the sound of the ocean and white sand between your toes. Good thing I came here not in holiday season, give me more chances to enjoy Gili Air to the fullest. The last snorkeling spot of the day was in front of Tami’s Neverland. I called it Gili Air Wall. The wall of coral reefs spoiled my eyes and gave breathtaking view under the water. The magical under water of Gili Air is unbeatable. Surprisingly, a sea turtle was coming to me. What a lucky day! I swam with sea turtle surround beautiful and colorful Gili Air wall for 10 minutes. The best moment I’ve ever felt under the water. Dinner with Mas Dita at Biba Pizza Cafe. Mas Dita ordered us Sea food Pizza and Lasagna. My first bite of pizza, oh delicioso! craving for more slices for sure. 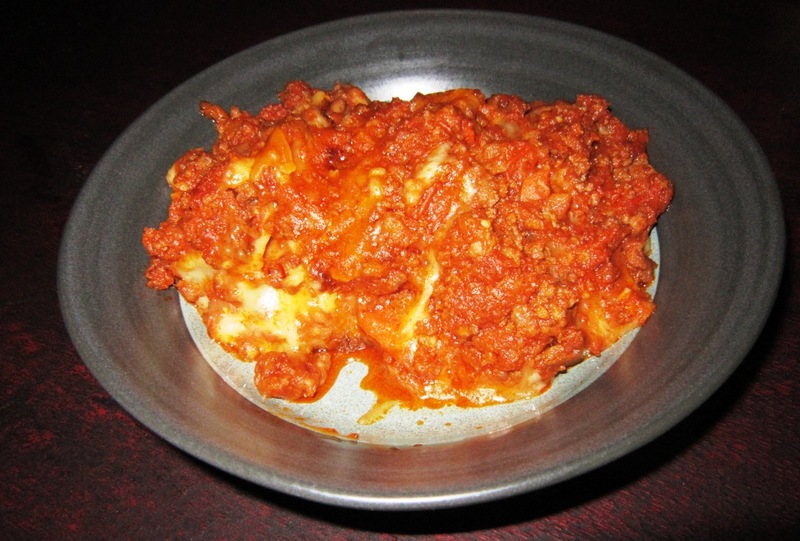 Lasagna was great also. Perfect combination of cheese, noodle and beef. 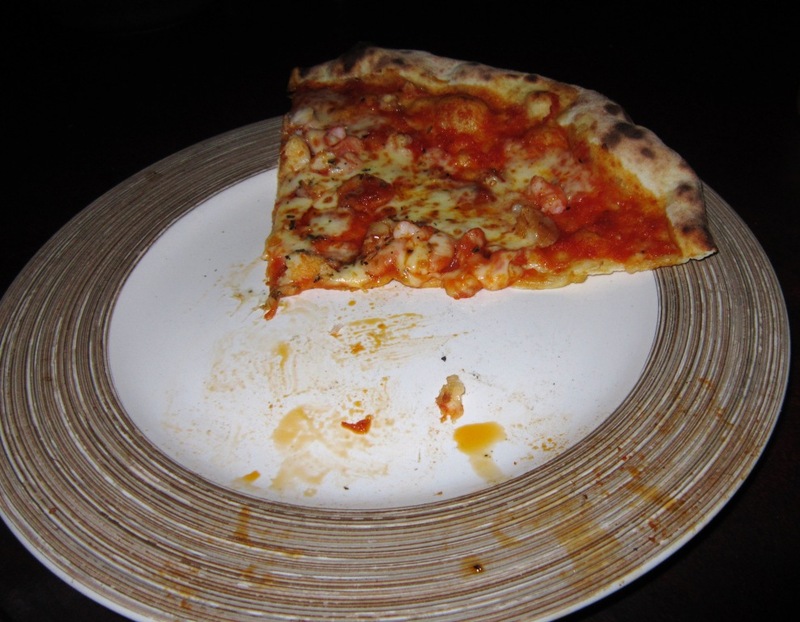 A tourist sat next to us said to restaurant waiter, i had the best pizza. From breakfast to lunch and dinner, i had the best meal. 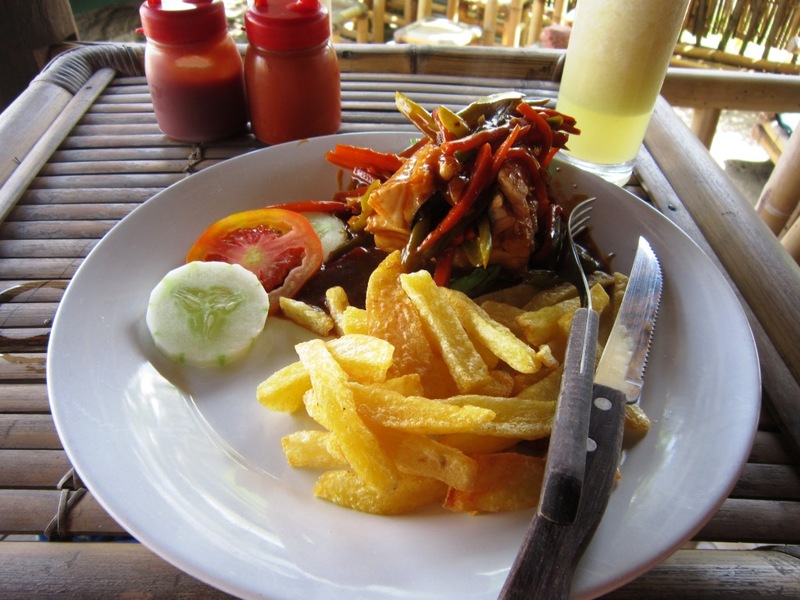 Gili Air offers great culinary from day to night. The third night was a full moon. 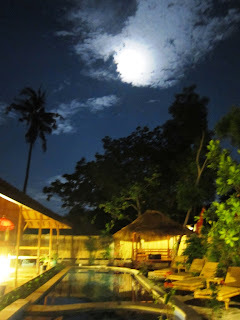 The moon was very bright above Omah Gili but was covered by clouds. Unfortunately, i can not take picture of clear full moon. My friend, Tatha was on Jogjakarta to celebrate Vesak Festival. I guess she can see full moon so clearly over there. Overall, my day was AWESOME. I had great food all day and swimming with three sea turtles in a day, it was awesome. 7 May, the last day before leaving Gili Air. Feelings of pleasure and sadness mixed together. Gili Air has taken my heart. I've fallen in love with this island. The place is really beautiful. No need to go anywhere, we can swim, dive, eat, snorkeling, sunbathing, cafe-ing in Gili Air. 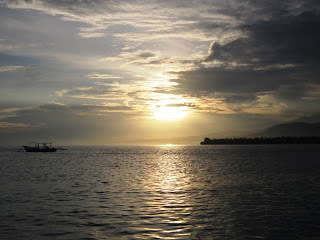 Here are some pictures before i left Gili Air, i took it when the sun rises in the morning. Still, a breathtaking view in the morning. When i left Gili Air by public boat, i promise to come back again to Gili. They say “If you come home as happy as you leave, you have had a good vacation.” I felt it. The best yet vacation in 2012. See you again Gili Air! "The tans will fade, but the memories will last forever."